Elaborate feather cloaks called ʻahuʻula were created by early Hawaiians for the aliʻi (royalty). Feathers were also used in women's skirts called pāʻū. The ʻiʻiwi (Vestiaria coccinea) and ʻapapane (Himatione sanguinea), which provided red feathers, were killed and skinned due to their abundance. Yellow feathers were obtained from the mostly black and rarer ʻōʻō (Moho nobilis) and mamo (Drepanis pacifica) using a catch and release philosophy to ensure future availability. In Māori culture feathers are a sign of chiefly rank, and the kahu huruhuru (feather cloak), is still used as sign of rank or respect. The elite class of poets known as the filid wore a feathered cloak, the tuigen. ^ Mary Kawena Pukui and Elbert (2003). "lookup of ahu". on Hawaiian dictionary. Ulukau, the Hawaiian Electronic Library, University of Hawaii. Archived from the original on 2012-07-18. Retrieved 2010-04-04. ^ "Na Hulu AliʻI: Royal Feathers ~ An Exhibition Of Rare Hawaiian Featherwork". Hawaii Visitors & Convention Bureau. September 2, 2006. Archived from the original on May 23, 2011. Retrieved 2009-11-29. ^ Hiroa, Te Rangi (1944). "The Local Evolution of Hawaiian Feather Capes and Cloaks". The Journal of the Polynesian Society. 53 (1): 1–16. ^ "Elton John gifted rare Maori cloak". The New Zealand Herald. December 7, 2007. Retrieved September 30, 2011. ^ Kay, Martin (9 April 2009). "Clark gets cloak for a queen". The Dominion Post. Retrieved 30 September 2011. ^ Ron Staton (June 9, 2003). "Historic feather garment to be displayed". 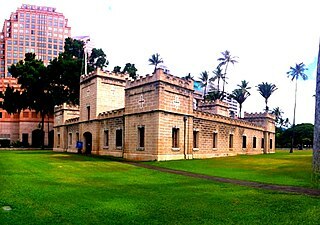 The Honolulu Advertiser. ^ Burl Burlingame (May 6, 2003). "Rare pa'u pageantry The grand cloak is made of hundreds of thousands of feathers from the 'oo and mamo birds". Honolulu Star-Bulletin. Retrieved 2001-11-29. Queen's Bath is a unique tide pool on the island of Kauaʻi, Hawaii. The pool is a sinkhole surrounded by igneous rock. It is located on the north shore of Kauaʻi in the town of Princeville, at 22°13′44.9″N 159°29′15.0″W. Small fish and tiny sea life also live in the tide pool, such as Hawaiʻian sea urchins, angelfish and the so-called "ghost fish". Nāhiʻenaʻena's Paʻū is the largest known Hawaiian feather cloak. It is a feather skirt (paʻū) made for Princess Nāhiʻenaʻena.